Burning wet wood is one of the two top barriers to pleasurable, efficient wood heating (the other is bad chimneys). Your wood heater can only operate with high efficiency and low emissions if your fuel wood has about the right moisture content. Properly seasoned firewood has moisture content of less than 20 per cent and is a pleasure to use. blue-gray smoke from the chimney. In short, trying to burn wet wood is annoying and wasteful. Many of these problems can be eliminated by burning properly seasoned firewood. Wood piled like this could rot before it dries enough to burnSeasoning wood is not just a matter of cutting your wood and throwing it into a pile. Dry wood is the result of specific actions you take. A commercial wood supplier may claim to have wood "cut last summer", or "two years old" and so on, but if the wood has been heaped in a field or just recently split, it will prevent your heater from performing to its potential. This is particularly true of modern EPA certified stoves, which perform extremely well when given the right fuel. Properly seasoned wood has another important but less obvious benefit. If you cut and pile firewood right away, moulds will not have time to grow. Mould, if it allowed to develop, will escape into your home’s environment when you bring the wood inside. Mould is an undesirable in modern homes and comes from many sources in addition to firewood, but minimizing its growth and circulation improves comfort and reduces allergic reactions. Stacking and air drying firewood before mould has a chance to grow is a good plan. Firewood should be cut to a consistent length to be most convenient to useThe wood you have purchased or cut yourself should be the right length for your stove, fireplace or furnace. This is usually about three inches shorter than the firebox width or length, depending on how you load the wood. In general it is better to have wood a little shorter than ideal rather than longer, first because it is no fun trying to jam too-long pieces into the stove in January and second because shorter pieces are easier to handle and quicker to dry. Normal firewood is 16 inches in length, partly because that length is one-third the 48 inch width of a full cord of wood, and second, because pieces longer than 16 inches are awkward to handle. 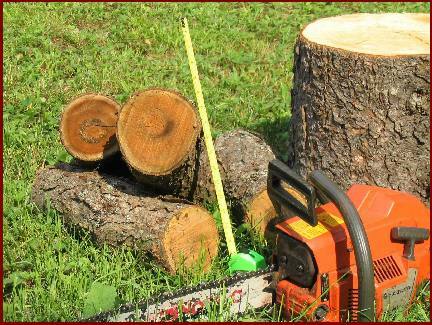 Good quality firewood is consistent in length, not varying by more than an inch or so. Next, split the wood to the proper size for your burner. For most efficient wood stoves, this is no more than six inches measured at the largest cross sectional dimension. Some furnaces can use wood that is slightly larger in cross section. Even for furnaces, though, big unsplit pieces make lousy firewood. A range of piece sizes is best so that when kindling a fire or reloading on a coal bed you have some smallish pieces that will help you achieve the desirable instant ignition. A selection of sizes from three to six inches in diameter for wood stoves and an inch or so larger for furnaces will probably serve you well. Keep in mind that firewood only begins to dry seriously once it is cut and split to the right size because in log form the moisture is held in by the bark. So, when buying wood, ask when the wood was cut split and properly stacked to get an idea of how ready it is for burning. For this reason, experienced woodburners like to get their wood at least six months before the heating season begins so they can manage the drying process themselves. 3. Pile in a single row exposed to the sun and wind. Piling in a single windrow is bestIf wood is to be below 20% moisture content when you burn it in the winter, it must have the moisture removed. The only practical way homeowners can do this is to allow the sun and wind to dry the wood for them. With this in mind, the wood should be piled in a place where the sun can warm it and the wind can blow through it. As the sun heats and evaporates the water from the wood pile the wind whisks it away. Here is a picture of my wood pile up against the back fence curving over the hill with plenty of exposure to the prevailing winds. 1 cord is four feet wide, four feet high and eight feet long. 1 of my ‘face’ cords (or stove cord) is 16 inches wide. 3 of my face cords equals one full cord. 3 of my face cords is a pile four feet high and 24 feet long. 4 full cords, or 12 face cords is a pile 96 feet long. I usually use a little over three cords per year so that I have a bit left over, just in case. If you don’t have enough space to dry your wood along a fence row, you may be tempted to stack a few rows together, but be sure to give some space between rows for the sun and wind to penetrate the stacks. This photo shows some very nice rows but they are stacked a little too close together for good exposure to wind and sun. Here is a more detailed discussion of firewood stacking technique. 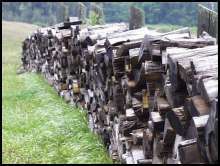 The hardest lesson: firewood takes a very long time to season Most folks who split their wood and stack it in well-spaced rows find that they can dry their wood in about six months. 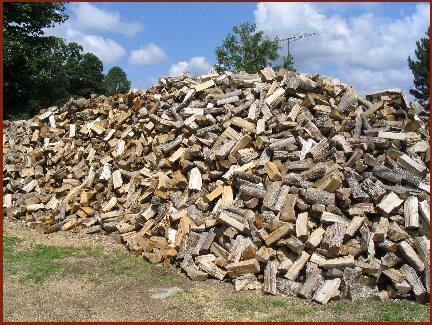 If you have your wood stacked in early spring it should be ready to put away for winter’s use by October. However, it may need longer than that if you live in a damp maritime climate or use very dense wood like oak, which is notorious for taking a long time to dry. If you burn very hardwood, it is wise to process or buy it in the fall for use the following fall. That way you'll be sure of having properly seasoned wood. 5. To cover or not? Some people like to cover the drying wood pile. I do not. I’m basically a lazy guy and putting old steel roofing, plastic sheets or tarps over the pile means that I would have to chase them when the wind blew them off. The theory behind covering the wood is that it will dry faster because rain will not soak the pieces as they dry. My experience is that the wood is dry enough by the time I want to bring it to my wood shed. Of course I may have to delay my wood shed filling if my dry wood gets rained on. I may have to wait for a few days of sun after a rain to continue stocking my shed, but it’s a great excuse to put off a chore! If it makes you feel better to cover your wood, do it. If not, just make sure you pile it in the shed after a few days of sun. Cut, split and stack the wood in the early spring and let it stand in the sun and wind until it is seasoned. For many people seasoning will take about six months. for others, it will be a full year, depending on climate and wood species.